The Environment Award for Children’s Literature, which started in 1994, is a celebration of books that promote a love of nature in children. Wilderness Society Victorian Campaign Manager Amelia Young described the importance of nature books when announcing the winners at the Younger Sun Bookshop in Yarraville late last week. ‘Children’s books catalyse the imagination and cultivate empathy,’ she said. ‘Through stories, we can step into other people’s shoes, and gain insights into animals’ lived experiences. Melbourne-based Anna Walker wrote and illustrated the winning picture book, Florette, about a young girl who finds joy in the green spaces of Paris. Brisbane writer Samantha Wheeler won the Fiction prize with Wombat Warriors, about a schoolgirl’s delightful relationship with a wombat. The Non-Fiction prize was shared by Queenslander Narelle Oliver for Rock Pool Secrets and coastal dweller Kim Michelle Toft for Coral Sea Dreaming. Rock Pool Secrets includes the recently deceased Oliver’s fantastic linocuts while Coral Sea Dreaming features Toft’s stunning hand-painted silk illustrations. 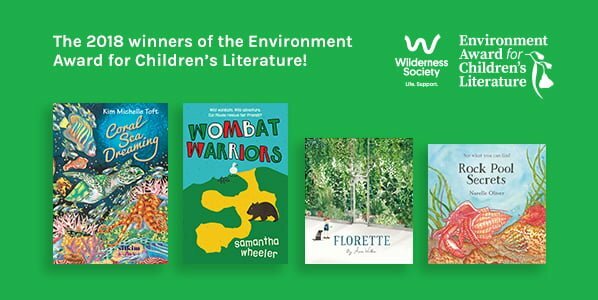 Previous winners of the Wilderness Society Environmental Award for Children’s Literature include books by great Australian writers Tim Winton, Colin Thiele, Paul Jennings, Jeannie Baker and Graeme Base. When Mae has to move house from the country to the city, she feels lonely and sad – until she discovers a beautiful place full of green in the centre of Paris. What she finds sparks something special and beautiful that will make her feel much more at home. Anna Walker writes and illustrates children’s books and is based in Melbourne. Crafted with pencil, ink and collage, Anna’s illustrations are inspired by the everyday details of life and the amusing antics of her menagerie. Anna’s book Mr Huff won the 2016 CBCA Book of the Year for Early Childhood and was shortlisted in the 2016 Prime Minister’s Literary Awards. Mouse is not prepared for her last-minute stay at Aunt Evie’s. How will she cope at a new school without her parents around? But before Mouse has even unpacked her suitcase, she makes a new friend – a wombat called Miss Pearl! Suddenly, being in a strange cottage doesn’t seem so bad, especially when she can snuggle up with a wombat. Mouse soon learns that not everyone in the area loves wombats, including Aunt Evie’s landlord, a sheep farmer who destroys them on sight. Can Mouse find her voice in time to keep her furry friends safe? Narelle Oliver (1960–2016) grew up in Queensland in a family who spent every spare moment pursuing interests in visual and performing arts. The linocut print medium, often combined with other media, was a special feature of her illustrations. Narelle was the author-illustrator of a number of award-winning children’s picture books: The Huntwon the 1996 Children’s Book Council of Australia Picture Book of the Year Award; Home won the 2007 Patricia Wrightson Prize; and Don’t Let a Spoonbill in the Kitchen! won the 2014 Queensland Literary Award for Children’s Literature. When daylight fades and the night shift clocks on, the reef becomes the height of activity and wonder, extraordinary creatures all working together to create an underwater masterpiece. Toft has revisited the reef with this book 25 years after her first book One Less Fish and highlights the growing urgency for immediate action to conserve one of the natural wonders of the world. Written in classic rhyme and illustrated with stunning hand painted silk illustrations, this book showcases coral reefs and all their beauty. Kim Michelle Toft has been writing and illustrating multi-award winning environmental children’s books for the past 25 years. Her hand-painted silk illustrations have been exhibited and sold all around the world. She travels extensively to schools nationally and throughout South East Asia spreading the message about the importance of the conservation of our oceans, coral reefs and coastal habitats which support them. Toft has lived her entire adult life on a beach somewhere in Australia and currently lives at Shelly Beach in Northern NSW.